Don’t use Spotify? Don’t use Google Play Music? Don’t use iTunes? That might mean you use Pandora, right? 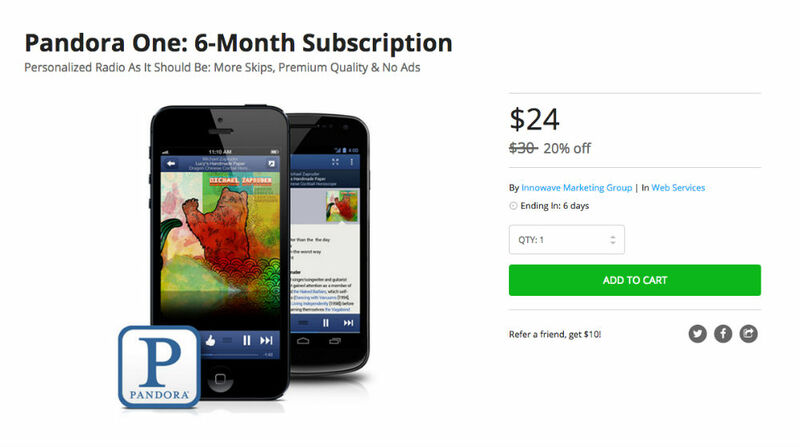 If you do, or if have always wanted to try out the the premium version of Pandora, called Pandora One, you can grab a 6-month subscription off of the DL Deals Store for just $24 – down from its usual price of $4.99/month, essentially netting you a free month of the service. Pandora’s ability to play great music for you that you may not have heard before is its strong feature, in my opinion. I remember throwing Gojira on, and a whole radio station of great metal was played thereafter. With Pandora One, there are no advertisements, more daily skips (for songs you don’t like), and you can use the service on any supported platform. If you need some more Pandora music in your life, check it out.